In the 11th chapter of the book of Genesis, we are introduced to Abraham, the patriarch of our faith. Before Abraham entered into the land of promise, however, he was part of the household of his father, Terakh. Terakh was from Ur, and decided at some point to move his entire family to the land of Canaan, in the west. For a reason not made clear, however, we are told in 11:31 that instead of ever arriving in Canaan, Terakh came to a place called Kharan, and chose to dwell there. Kharan was a stopping-point between the two destinations, and apparently, it became a suitable-enough land for Terakh, as he is shown to have abandoned continuing his original journey westward to Canaan once his family made it to Kharan. For the English reader of Scripture, it might be noted that Terakh had a son named Haran, and the place which he ended up settling while on his journey to Canaan is also named Haran. However, the English here does an unfortunate disservice to the Hebrew language, for while the son’s name is indeed Haran, the place-name is better rendered Kharan, as they are not spelled or pronounced the same in Hebrew. They are two different words, and the distinction is important to make clear. And the days of Terakh were five years and two hundred years. And Terakh died in Kharan. Terakh’s desire to move to the land of Canaan was never realized. He never brought his family further than a place essentially known as “Desolation.” The word KHARAN comes from the two-letter KHAR root, which essentially has the meaning of something dried-up, harsh, hot, angry, where circumstances are not conducive to life. 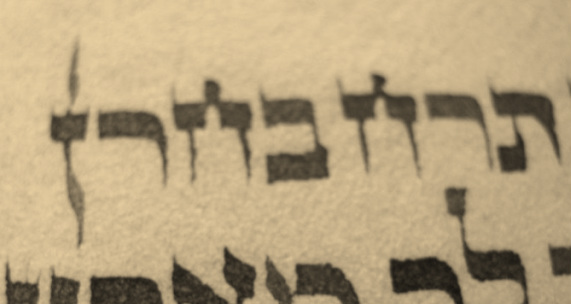 It forms the basis for many Hebrew words that fall under similar definitions of meaning. This root idea is important to consider, for it shows us that Terakh’s purposed goal of Canaan was not reached. Rather, he died in a desolate circumstance. As unfortunate as it may be, however, there is a very interesting detail of hope in it all. In very old scrolls of the Torah, this verse contains an anomalous letter that is not used in any other place in the Word. 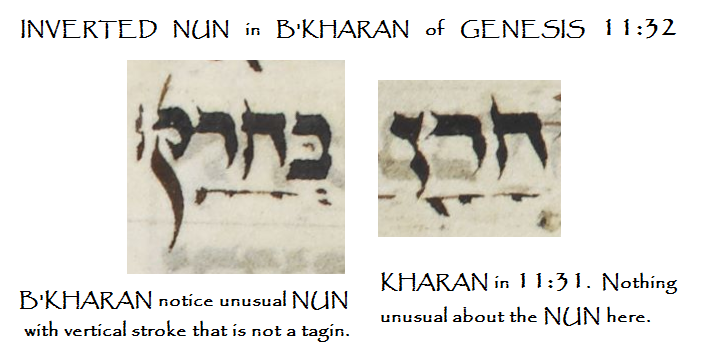 In the Hebrew phrase B’KHARAN, meaning “in Kharan,” the letter NUN, yielding the “n” consonant that ends the word KHARAN, is incredibly unique in appearance. The following image displays one rendition of this particular letter as it appears in an ancient Hebrew manuscript of Genesis. In this above manuscript, note that the letter is not extending upwards at all, but drawn completely upside-down, yet with a “head” on it so as to alert the reader that this is, indeed, a NUN, but a very odd one, and obviously done entirely on purpose. Further very drastic embellishments are added to the “bottom” of the letter to create an even more distinctive form to grab attention to the anomaly. 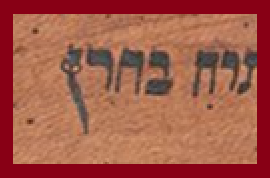 The following two images come from Torah scrolls where the normal shape of the letter NUN was preserved as much as possible, but a slimmer “leg” extending upwards is rendered also, in effort to show that the letter should be viewed as upside-down, even though it is technically right-side up. The vertical “leg” on the top is most assuredly not to be viewed as part of the normal taggin / “crowns,” but is a uniquely-placed leg that effectively allows the reader to view the same letter NUN whether one reads it right-side up or upside-down. These two images from Torah scrolls show other ways in which the unique, ancient form of writing the letter here has been preserved. The one on the left appears to be reversed, to face back towards the rest of the letters in the word B'KHARAN, and is drawn with a curious curl to the left. 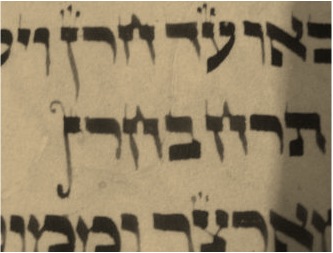 The one on the right, from a Torah scroll with ink damage visible, has swirling extra "legs" coming off either side of the letter diagonally, showing that there is something special going on in the presence of this anomalous letter. This image from a scroll written in Germany from the 15th century also preserves among all the cracked and flaking ink the unusual presentation of the letter NUN in a manner that almost makes it look like a reversed final letter PEH. ​In this scroll, also from the 15th century, the scribe employed a very subtle method to signal that the NUN of B'KHARAN was unique - by making a circle that extends from the bottom of the head of the letter. None of the other NUNIM in the surrounding text have this extension except this one. This unique method of writing the letter NUN is a very odd and ancient tradition, and is hardly in use anymore. But what is the original spiritual purpose behind turning the last letter NUN completely upside-down? Perhaps there is no way to ever truly know, but one can make some educated attempts at trying to understand the spiritual and symbolic merit of it, based on what we know of the letter and how it can be viewed in the surrounding text. The first issue of importance in better understanding this unique rendition of the letter NUN is addressing the root idea in the Hebrew that makes up the letter itself. NUN in Hebrew is part of a group of words that all stem from the two-letter root of NU, signifying a “movement” of some kind. This underlying factor cannot be ignored in this instance of the upside-down NUN. The entire context of the passage is the journeying of Terakh’s family from one land to another. The whole context is that of “movement.” In addition to the over-arching context, there is the verse’s detail that Terakh died in KHARAN. Thus, in the midst of his grand move, he had instead become sedentary, desiring to cease his family’s journey, and in that choice, he experienced yet one more journey himself – death. The upside-down NUN could be said to be a nod to all of these details. Additionally, it is at the death of Terakh that the desire of the Holy One is made known to Abraham, Terakh’s son. The journey Terakh failed to complete would be restarted and finished with Abraham. Thus the choice by Terakh to cease the journey and remain in KHARAN / “Desolation” was essentially “overturned” by the will of the Most High, and He chose instead the son, Abraham, to complete the trek to Canaan. It thus is seen that at the death of Terakh in Kharan, Abraham was “chosen” to lead his family onward, and inherit the land of Canaan by eternal decree of the Holy One. The Word tells us several times that Abraham and his seed were chosen for this purpose. The unique appearance of the letter NUN in B’KHARAN is therefore a hint that the movement of Abraham to Canaan is all because he had been BAKHAR / “Chosen” to participate in the covenant with the Most High. This participation in the covenant was at the beginning stages, admittedly. It would take hundreds of years before his descendants would actually take possession of the land promised in the covenant. But even more so, the covenant Abraham was chosen to be a part of would culminate in the entering-in of others who were outside of his own family and descendants. Indeed, the journey out of Kharan and the chosen status of participating in the covenant of the land would one day include Gentile peoples, as well. 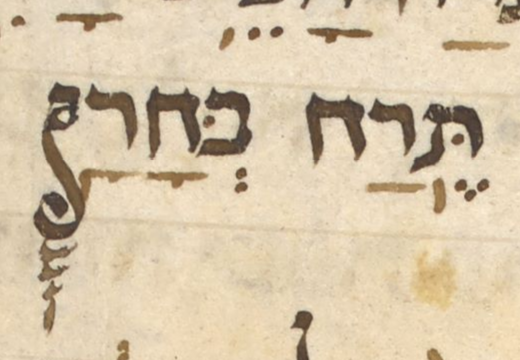 This factor brings us to yet another detail of this unique-looking letter NUN that is worthy of attention: those Jewish commentators who have made note of the unique letter have given it an equally-unique name: Nun M’gulgolet. Regarding just its simple translation, this essentially means “A Nun on its head.” There is nothing inherently significant with that designation for the letter. However, when one looks at the name of the unique letter with open spiritual eyes in conjunction with what has previously been discussed of its purpose in the text, such a curious name as Nun M’gulgolet takes on a whole new importance that cannot be ignored. 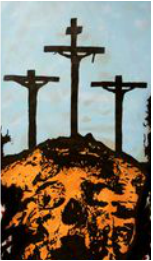 The place where Yeshua the Messiah was crucified is called “Golgotha” in most English translations. The word GOLGOTHA is actually Aramaic in spelling and in pronunciation, and means “Skull.” The cognate Hebrew term would be GULGOLET, meaning the exact same thing. In fact, if one were to translate “place of the skull” into Hebrew, you would say MAQOM HAGULGOLET. It is interesting that the letter NUN in its upside-down form was so long ago given the designation M’gulgolet, as if it were pointing to the Maqom HaGulgolet / “Place of the Skull,” where Yeshua gave His life to open up the covenant originally made to Abraham to all who would be willing to make that same spiritual journey from Kharan / “Desolation” to the promised land. One could just as rightly translate the designation of Nun M'gulgolet as "the Golgotha Nun," or perhaps, when taking into consideration the root idea behind the letter NUN being that of "movement," you could just as well translate it as "the Golgotha Journey." Abraham had no idea that his initial move beyond Kharan to the land of Canaan would ultimately lead untold others to Golgotha, and the covenant offered there. This is the journey that every person of faith must take. Out of wrath, we are chosen to be His people, to go where He leads. The journey takes us through death to a life the abundance of which we cannot fathom with earthly minds. In this extremely-unique preservation of the letter NUN, there is contained the idea of a continued journey beyond an existence of desolation and death, because the One who has called us has chosen us to also partake of the eternal covenant that was opened up for mankind at Gulgolet - the place of the skull.